Please join us on July 24th at the Joe Cole Recreation Center! 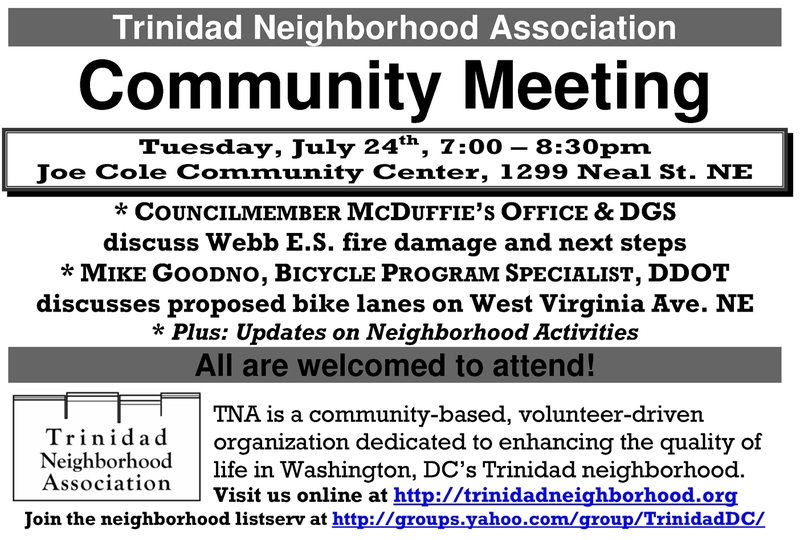 Councilmember McDuffie’s office and DGS will discuss the recent fire at Webb E.S. and inform the community of the next steps with regard to the damage and the disposition process. Mike Goodno from DDOT will share a bike lane proposal for West Virginia Avenue NE [pdf] The major change required to install the bicycle lanes per this draft plan would be the removal of the parking lane on the Gallaudet University side of the road. Removing this parking lane would create the necessary 10’ of roadway width to install a 5’ bicycle lane on each side of the road. Posted on July 13, 2012, in Meetings and tagged DDOT, DGS, property disposition, TNA, Webb E.S.. Bookmark the permalink. Leave a comment.